Our NACK exhibit stood proudly nearby the stage where dignitaries representing Nassau County expressed efficacious pleasure for this long-awaited trail way. 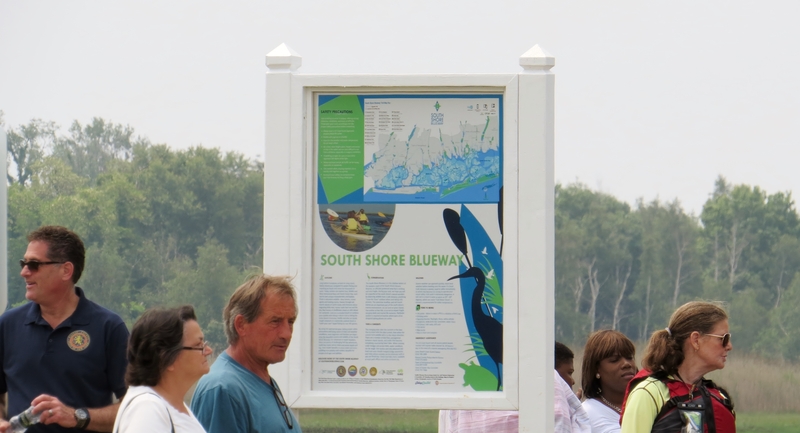 Executive Edward Mangano, Senator Todd Kaminsky, and other local officials from surrounding towns were among proud ribbon-cutters that opened the way for us to disperse into our fine scenic salt marshes along the southern coast of Nassau County. This is just the start for us to tour and bask in the serenity, beauty and peacefulness of pristine, undisturbed natural areas amongst a network of trails and launches. As the red ribbon dropped, all water craft hit the waters taking us across the way to land at Hewlett Point Park Beach. For me, paddling this mile long trail among the many other water travelers, reminded me of rush hour on the Long Island Expressway. But I do have to admit, it was really a lot of fun. Drones flew over our heads and spectators lined the Bay Park Beach Shore to capture it all. The paddle back awaited us with a gamut of special events and presentations. NACK was among the first to perform wet-exit rescue and recovery and rolling demonstrations. Our President John Weickert, Jr. took the bull by the horn (literally speaking) as he shouted through a huge bullhorn the step-by-step process demonstrated by our brave members Steve, Debbie, and Alan. Of course Chris, our exceptional boat rolling expert, was not to be missed. Everyone cheered. 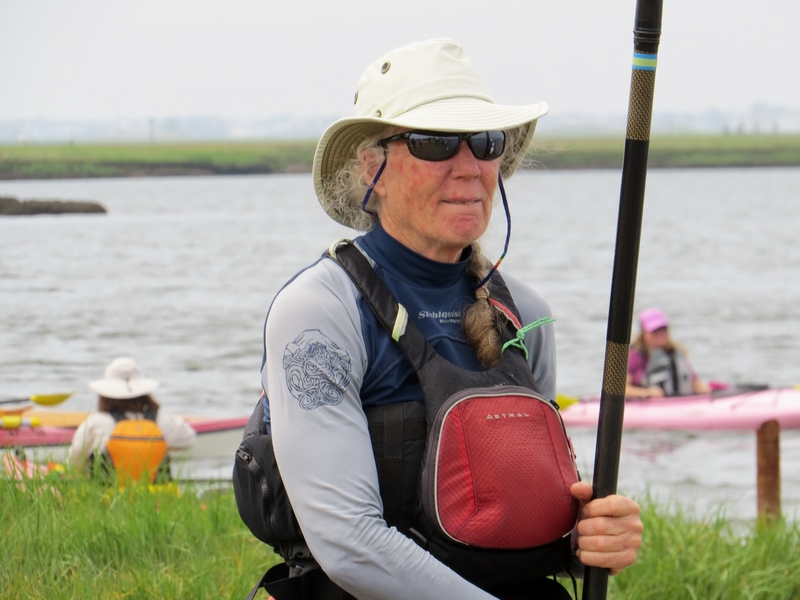 Elizabeth O’Connor demonstrated, handling, maneuvering and how to pack a kayak. Empire Kayaks Stand-Up paddle board yoga then took the stage (or should I say water). Hobie fishing team gave a kayak fishing seminar. 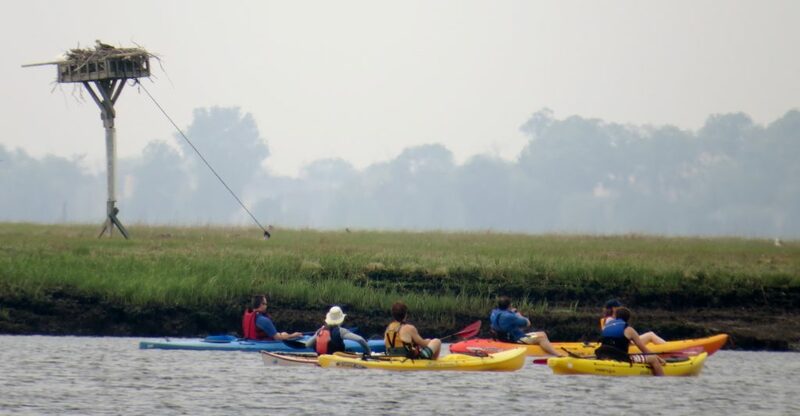 Freeport Kayak Rentals provided hourly family kayak launching. Empire Kayaks also gave an eco-tour. 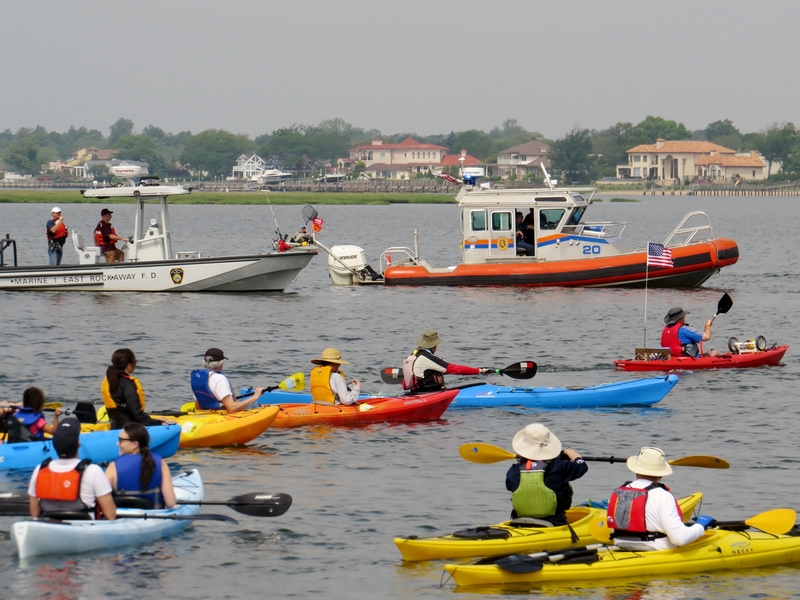 Among the many other kayak clubs on site were Long Island Paddlers, Like Island Kayak Enthusiasts, North Shore Kayak Club and surrounding Kayak business venues including Dinghy Shop. All took to the waters for various tours. Besides NACK, among the many other exhibitors present were first and foremost Friends of the South Shore Blueway (they gave out duck whistles, mini duck toys and Blueway maps), Town of Hempstead – Marine Nature Study Area, Norman Levy Park, Jones Beach & Theodore Roosevelt Park, Kayak Fishing Association, and many other exhibitors. Nice day & a great article Rhonda, thanks for the pictures !